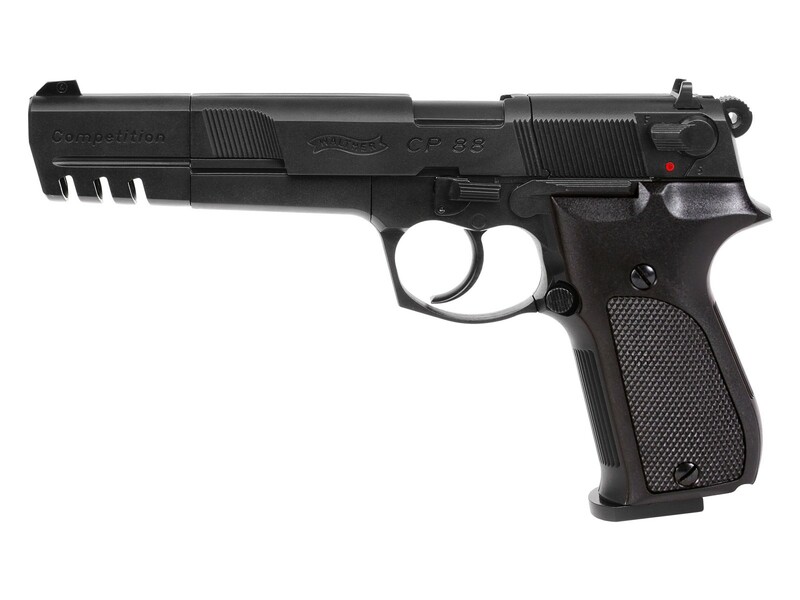 Read more about the Walther CP88 in Dennis Adler's Airgun Experience Blog. A new generation of CO2 airguns! The original Walther design as well as the outstanding workmanship are impressive. This 8-shot double and single action repeater represents a giant leap forward in CO2 pistol technology because it's both fast and easy to reload with the convenient 8-shot rotary magazines that can be preloaded until you're ready to shoot. Due to the modular system the pistol can be used for various shooting activities. It is a popular gun for beginners and training purposes. Things I liked: Pyramid Air shipped my Walther CP88 in nickel with walnut grips quickly and securely. With such a long sight picture, the pistol is fairly accurate out several meters. It's been very effective at taking out gophers and other similar sized pests. Things I would have changed: The sights, provided with the pistol, are not as precise as they should be to match the capabilities of the pistol. What others should know: This is a serious piece. Well made, and very authentic looking. Even the sheriff thought it was a firearm! Things I liked: The looks and the feel of the pistol are second to none. Shot count per CO2 cartridge, +- 50, is very good. Airgun pellet mags work very well. If you are selective with your choice it will even shoot RWS pointed pellets. Things I would have changed: The trigger is probably the biggest disadvantage for accurate shot placement. Shot is fine out to 15-20 feet. At 30 feet and beyond POI really opens up. Front and rear sights should have white dots. Walter combo rail should be made of aluminum to match the rest of the pistol for a more stable platform to mount optics. Needs a second screw to secured to pistol. Not sure why Walter chose to use brass to secure CO2 cartridge. I would trade shot count for some more FPS. What others should know: It's a pistol that I want to like but for the money there are better bangs for the bucks available. Example are the the Beeman P17 and Crosman 2240. These shoot so accurate that it becomes effortless. Good way to relax. Shooting the Walter CP88 is akin to shooting some of my springer refiles. Can be frustrating and challenging. Best grouping are with RWS pellets. Things I liked: I like the looks and the feel of the pistol. Shot could of +- 50. It's a pistol I wanted to like but the accuracy left a lot to be desired compared to my Crosman 2240 and Beeman P17's. These two pistol brands have set a high standard given their low cost and accuracy. Things I would have changed: Better QC from Walter and PA especially that I payed the 10 shot check before it was shipped. PA could have saved both of us some time and money had they gone over the pistol. Mounting option for optics are very limited. The rail that mounts on top on pistol is made of plastic, held on by only one screw. Sights should have white dots at the very least! What others should know: This is my first Walter product and one has to wonder about their QC. My Crosman 2240 and two Beeman P17 were no where near the price point of the Walter. This is one time that one does not get what one pays for quality wise.The accuracy doesn't match the looks then it's all for show. Tried six brands of pellets with different weights. Shot placements left me wondering how and why all of them could be so wildly inaccurate. Is the "Nickel" finish coming back? What was wrong with that finish? They looked great! What are the best pellets (brand/shape) to use in this gun?